Photos by Rachel Von | The Journal Gazette Ken Frantz, 92, talks about the book “The Seagoing Cowboy” at his daughter’s home in Fort Wayne on Monday. Frantz traveled overseas to help the post-WWII rebuilding effort. Frantz has kept a stack of letters he wrote in 1945 to his girlfriend, and later wife, Miriam. Ken Frantz’s lips slightly quiver, and the eyes that have seen 92 years begin to form tears. The still-strong voice that so often rang from the pulpit in his career as a Church of the Brethren minister rose to an anguished, nearly inaudible squeak when he heartbreakingly recalled November 1990, when his wife of 45 years, Miriam, died at the age of 66. "We gathered together, said our goodbyes, and had the funeral later," says Frantz, overcome with emotion. "We let some of the children shovel some of the dirt back into the grave." Seated at the dining room table in the west side home of Ken and Miriam’s daughter, Ruth Ann Bever, Frantz reaches for a stack of letters he had written to Miriam before they were married. All were still folded in their fading envelopes with 6- and 8-cent postage and "VIA AIR MAIL" stamped on the front. Many had a New Orleans postmark; June 16, 1945. Others would quickly follow: June 17; June 18; June 19. 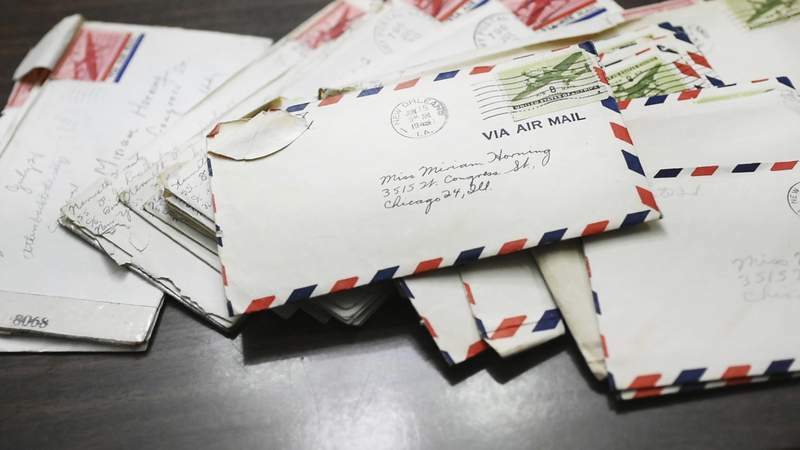 More letters were postmarked from the U.S. Army Postal Service, and the U.S. Navy. As he clutches those letters, each with her address in his neat handwriting, he remembers. When 21-year-old Ken Frantz heard about a post-World War II restoration project that was looking for volunteers to tend to cattle and other livestock being sent to Europe, Miriam Horning was among the first he would consult. Even though they hadn’t set an official date, they had talked about getting married soon. "My girlfriend and I didn’t have time to be married that summer," Frantz says. "We talked about it and decided this was important enough to go, so we delayed the wedding." With several envelopes of correspondence in front of him – some holding three, four, five letters – Frantz looks at them and says, "These are letters I sent to her." Both had recently graduated from Manchester College. Since Ken and his family lived in North Manchester, he stayed behind. She had returned to her home in Chicago, on West Congress Street. That’s where he asked her if it would be alright to delay their wedding a few months so he could cross the Atlantic Ocean on a mission of mercy. Of course, she told him. Go. He would not see her again for another six weeks. Postwar Europe was in shambles in the spring of 1945. Hitler was dead; the Third Reich had fallen. Cities were charred shells of what they once were. Towns were flattened altogether. Children played on mounds of red bricks that could have been their church, or school, or even their homes. Country houses and farms were destroyed. Many animals – ­horses, cattle, donkeys – lay rotting in the fields, casualties from the bombing raids that dropped terror throughout the continent. Shortly after Germany’s surrender, the United Nations Relief and Rehabilitation Administration organized a program supported by 44 countries that would send about 200,000 horses, mules and heifers to nations devastated by war. An estimated 7,000 volunteers fanned across Europe – to Poland, Italy, Yugoslavia, France, Belgium. Believed to be the first ship to sail on behalf of the new ­UNRRA project, the S.J. Luckenbach left New Orleans June 24, 1945. Twenty-five men, including recent Manchester College graduate Ken Frantz, would be on board. With them were 588 horses. Their destination was Greece. "They were loaded on a Sunday," Frantz says of the horses. "That was our first day with them. Then we left about 6 o’clock that evening. We were tending to business, then all of a sudden – about 6:15 – we discovered we were moving. So we were going down the Mississippi. … Beautiful evening that night. Good moonlight." By tending to horses and donkeys and already-pregnant heifers (baby chicks on board pushed the estimated number of animals to 300,000), the volunteers would earn a unique title in United States war history: "Seagoing Cowboys." Peggy Reiff Miller, an author in Goshen, was introduced to the term in 2002 when photographs she received from her father revealed that her grandfather was a "seagoing cowboy" in 1946. "Grandpa’s pictures just kind of beckoned to me," says Miller, who interviewed several hundred participants to serve as sources for a novel. "One cowboy led to another and then another. Their stories were just so fascinating and compelling, and I realized, here was a history that was just hiding away in people’s minds and drawers and attics. My focus kind of shifted. I did get the novel drafted, and it’s put away and resting. But I shifted to wanting to document the history while these guys were still living." 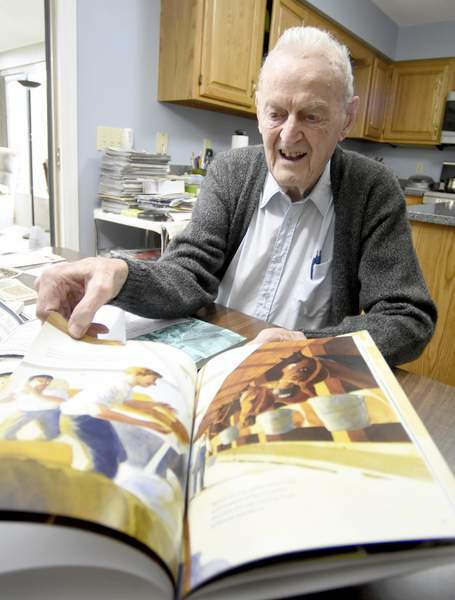 On March 31, "The Seagoing Cowboy," a 39-page children’s book written by Miller and illustrated by Fort Wayne artist Claire Ewart, was published. Although the book’s two main characters are fictitious, they nevertheless represent a compilation of experiences from the men Miller interviewed. Sitting at the table, Frantz pats a copy of the book he was given and says, "This is amazingly accurate. You can see it. You’d think she was on the trip herself." Miller, Ewart and Frantz will appear Wednesday at the Canterbury School Spring Book Fair, 5601 Covington Road, to share the story. "We’re not taught much about what happens after the war," Miller says. "I think it’s an important piece because countries have to be repaired. If they’re not repaired, it leads to another war. "The other thing the book does is it connects families with their own history. Because there were a lot of these cowboys that didn’t talk about their experience, grandkids grew up not knowing that their grandfathers were seagoing cowboys." Away from New Orleans, across the Gulf of Mexico and around Florida, the mission headed north. More than 70 years later, Ken Frantz has detailed recollections of the trip. "Temperatures were in the 80s," he says. "We were in the Gulf Stream for about a week until it came time to go across." He takes out a map, and with his finger, draws a straight line across the Atlantic. He remembers the day-to-day work on ship; of caring for the horses; of feeding them hay and oats and bran; and of cleaning the stalls. "We threw the manure overboard through the port hole, which was a little above," Frantz says. And now those aging eyes begin to dance. "Harvey Stump was down below us a couple decks. One day we were throwing out the manure, and he happened to be looking out the port hole at the same time. That was one of the fun things." He remembers a colt being born somewhere across the Atlantic. He remembers the meals were good when the ship wasn’t rocking. And he remembers writing to Miriam back in Chicago whenever he could. "The voyage across was three weeks long," Frantz says. "We got to Gibraltar in about two weeks, stopped there to take on a harbor pilot because every harbor, they have a pilot to take the ship through (to the Mediterranean Sea). Then we went on to Greece. … And that’s where we unloaded the horses." There was little fanfare on July 16 when the S.J. Luckenbach arrived into Patras, which is Greece’s third-largest city and because of its commercial port is called the nation’s "Gateway to the West." "(Horses) were unloaded into a field," Frantz says. "The farmers would come and they were given a horse. Most of the contact we had with the Greeks was with the children. As (Miller) says in the book, they were always looking for ‘goomi.’ They wanted chewing gum. So we had some candy and some chewing gum we could share with them." Before they returned home, Frantz and his fellow cowboys had a final request. Would the captain allow them to leave ship to tour a little bit of Greece? "So a bunch of us got together and hired a 1935 Ford truck and went over," he said. "We left about 10 o’clock in the morning." Frantz proudly holds a small, faded photograph of 25 men posed standing in front of the famous Parthenon in Athens. That’s him, near the middle, top row. Shortly after that picture was taken, they would be on their way back home. It was Aug. 26, 1945, when Kenneth Frantz and Mariam Horning were wed. They would have three children, seven grandchildren and seven great-grandchildren. "Its quite a story," he says. "I’m glad to be part of it."